Drinking wine at meal time, parties or during any other occasion can get you interested in a wine cooler, especially if you are looking to make a habit of it. As a beginner, you will definitely want to get an affordable wine cooler that not only keeps your wine chilled but also takes up minimal space with the least disturbance to your regular house arrangement. 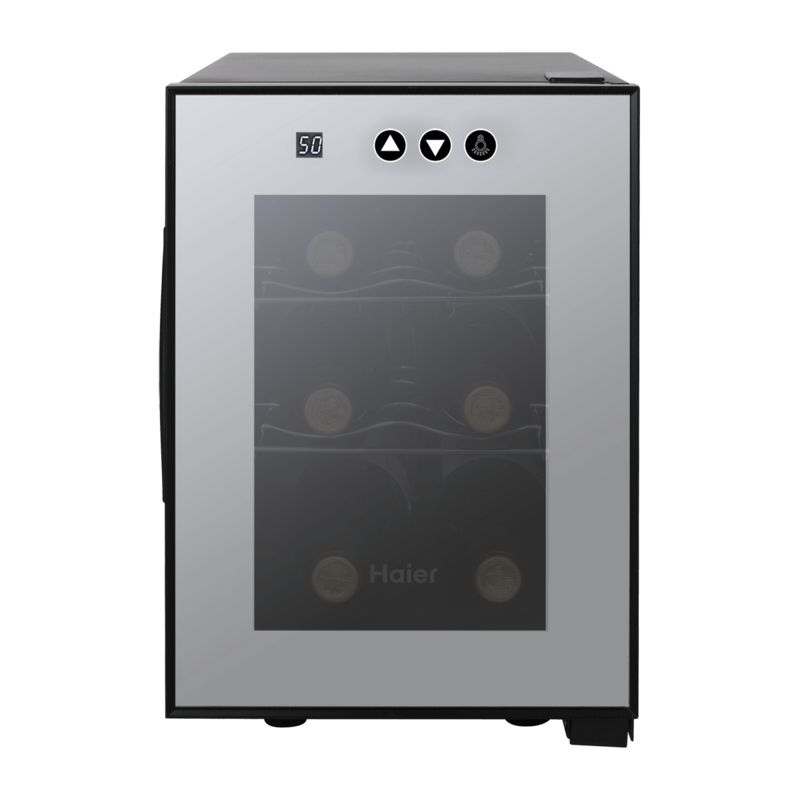 The Haier 6-Bottle Wine Cellar is a single zone wine cooler that is small and compact to fit on a kitchen counter blending in with other countertop kitchen appliances easily. This being a single zone unit, you will be limited to cooling one type of wine at a time. Reds and whites have their optimal serving temperatures; this also dictates their storage temperature. A single zone wine cooler will be suited to wine enthusiasts who already have a favorite type and will therefore need to store the wine in its optimal temperature without any compromise. The Haier 6-Bottle Wine Cellar is definitely great if you are only interested in storing a few bottles for a short period, preferably if you mean to keep your refrigerator free of wine bottles especially during events or for personal consumption. When shopping for a portable wine cooler like the Haier 6-Bottle Wine Cellar, it is important to make sure that it is not only compact but also aesthetically appealing. In this day and age, kitchen appliances are not only designed to be highly functional but also appealing. This is the same with this counter top unit. You will be able to place it on top of any counter with the sleek dark design appealing to all who lay eyes on it. The blue LED internal light enhances this appeal by standing out from everything else. The stainless steel finish blends in with contemporary kitchen décor. The unit comes with a digital display and controls to keep your wine at the correct serving temperature. When it comes to enjoying your glass of wine, you can only savor the rich flavors at the perfect temperature. Use this digital display to monitor the unit’s temperature and set the optimal range for the wines stored within whether red or white with the simple to use controls. To maintain this set temperature at highly accurate levels, the unit also comes with a double glazed glass door to maintain the cool temperatures and avoid temperatures dropping. This is also great for energy efficiency as well. With cool air being maintained within the unit, the cooling system will not be forced to run all the time. Perhaps one of the features you will like the most about this unit is the fact that it uses thermoelectric cooling. In most cases, when it comes to counter top units the noise resulting from the vibrations made from the cooling system can be very annoying. The Haier 6-Bottle Wine Cellar maintains silence in its operation to the thrill of most buyers. Wine enthusiasts can place the unit on any counter top and not have to deal with the constant vibrations usually common in older units that put off most buyers. Ultra violet light is one of the most damaging elements to wine. When wine is exposed to UV rays, it degrades in terms of quality. This will negatively affect the wine drinking experience. Owning this unit will however put an end to this as it comes with a tinted glass door. This is designed to filter out the damaging UV rays and therefore keep your wine in the best condition until you pop the cork and indulge. Adjustable shelves on the Haier 6-Bottle Wine Cellar mean that it fits all wine bottle sizes you might encounter. For a small unit, this is a great property that can mean the difference in storing your favorite wines. For individuals who are just starting up when it comes to drinking wine, this unit is highly recommended. It is affordable and compact enough to fit anywhere the owner wants to place it. Most importantly it makes it possible to enjoy wine at its best and therefore get a great start for better experiences in the future. If you do find that wine drinking is not for you, the unit can be used to store wine for various occasions. The 6-bottle wine cellar from Haier is designed to be easy to adjust and helps to keep the wines inside the cooler from being at risk of damages from UV rays and other common outside threats that can get in the way. Will the Light In Your Wine Cooler Hurt Anything?